Tecnológico de Monterrey (Monterrey Tec) is the first planned university campus in Mexico. While some of the essential elements of the 1945 plan still persisted, there was no culture of planning, and recent buildings violated the powerful sustainable integrity of the original plan's vision. The university, along with a consultant team, undertook a planning process that captures the essence of the original plan but reflects a new education vision and sets the stage for continued expansion of Tec's role in the neighborhood, both in Monterrey and beyond. The plan also focuses on helping reverse patterns of urban decline and return Monterrey to its reputation as the safest city in Central America. Monterrey is Mexico's third largest city and the heart of innovation and entrepreneurship. A combination of disinvestment in city center neighborhoods, long-term effects of urban sprawl, and aging campus infrastructure have led to the decline in vibrancy both on campus and in the surrounding communities. Regeneración, developed in collaboration with Tecnológico de Monterrey, the City of Monterrey, and Sasaki Associates, addressed the role higher education can play in urban regeneration and building healthy and vibrant communities through community engagement. Throughout the planning process, the consultant team acted as the bridge between community and university, resulting in development and enhancement projects all supporting one another. Facilitating rapid growth of research partnerships. To capture the importance of projects, the team created a dynamic chart that prioritizes more than 50 development projects based on amount of investment. The master plan also features design sketches for each of the priority projects. The majority of recommendations made in Regeneración are physical upgrades to joint spaces shared by both the community and university, such as the rebuild of Tecnológico Park, an outcome from extensive surveying of students, faculty, and university staff. The campus is isolated from its surrounding neighborhoods. A recent cycle of disinvestment in the community has reinforced the perception of unsafety and neglect. Tecnológico Park, the largest park in the district, had turned from a family-friendly community space to an unsafe, neglected property. Public meetings and in-person interviews helped uncover what the community and students felt was missing in the park space. Today, Tecnológico Park is a symbol of revitalization and the lasting bond between the university and surrounding neighborhoods. 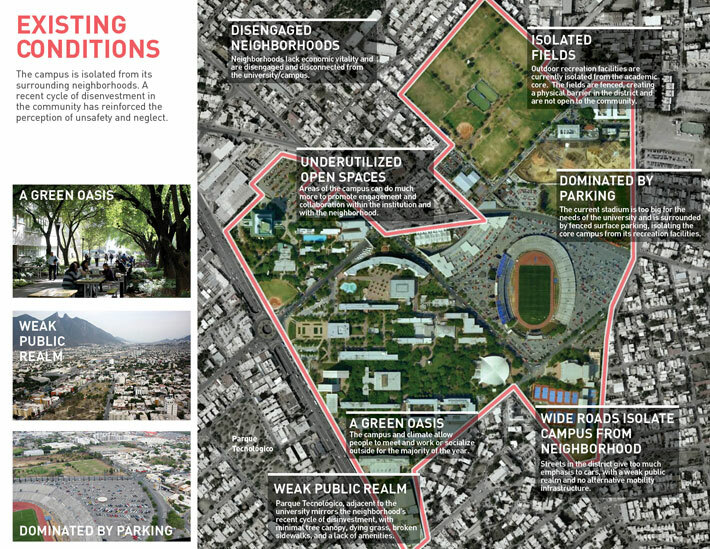 The Master Plan also generated a district-wide mobility study on the creation of a natural resource-rich urban environment; reduction of parking lots; a proposed TransitHub that would integrate the existing Monterrey bus system with district shuttle system; and proposed streetscape improvements to create safer, pedestrian-friendly streets. 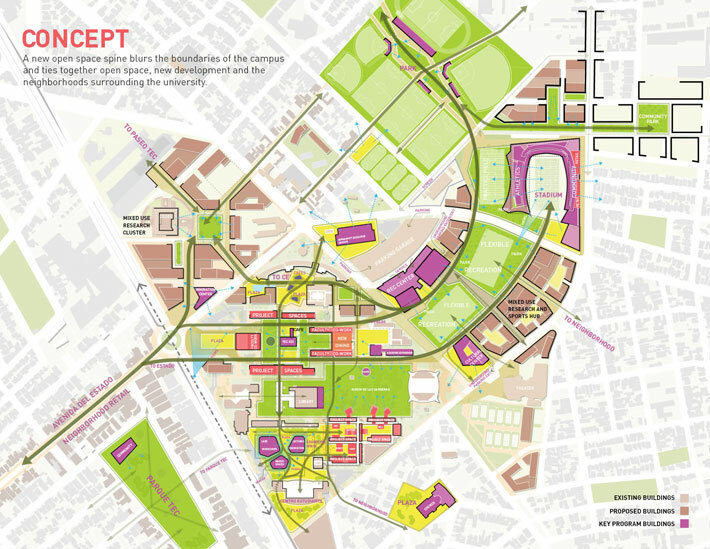 The plan has since been adopted by the university's board of trustees and earmarked for $200 million for implementation of priority revitalization projects like the rebuild of Tecnológico Park. Monterrey has already begun to see new investment in neighborhoods surrounding the university, marking an exciting time for city dwellers and students alike.